The Carolina Fly Fishing Club’s 5th Annual Meeting and Banquet at the NorthStone Country Club in Huntersville, is Wednesday, November 14. This is the biggest and best social event of the year for CFFC. A great time to mix, socialize and meet members, spouses, and friends. And, the food, everyone has always spoken well of how good the food and service is. We will have Prime Rib and Mahi Mahi and all the best sides to go with it, along with some great deserts. A cash bar will be provided and we will have some light Hors d’oeuvres. This is our biggest fund raiser of the year. You will be surprised at how many items we will have and what a great chance you will have to win one or more of our great prizes. Rod, reels, rod cases, chest and waste packs, fishing tools, flies, guided fishing trips, and much more. So, please get registered on our web site as soon as possible so we will know how many tables we need and how much food to plan for. Banquet time, cost and directions are posted on our registration page. We will also elect CFFC Board members for 2019. More details of the event will follow. Non-members may also register and we hope you will consider joining our club. 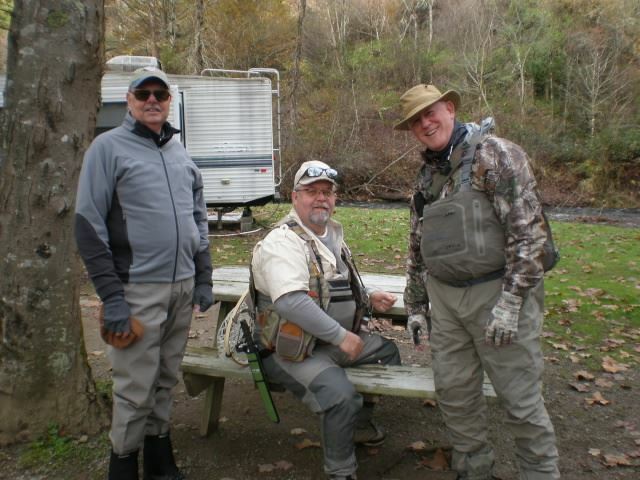 CHARLOTTE – Project Healing Waters Fly Fishing is pleased to announce that its program will be hosting “Healing Saturday,” on Saturday, September 29, 2018 to raise funds and awareness of their cause and the injured and disabled veteransthey serve. 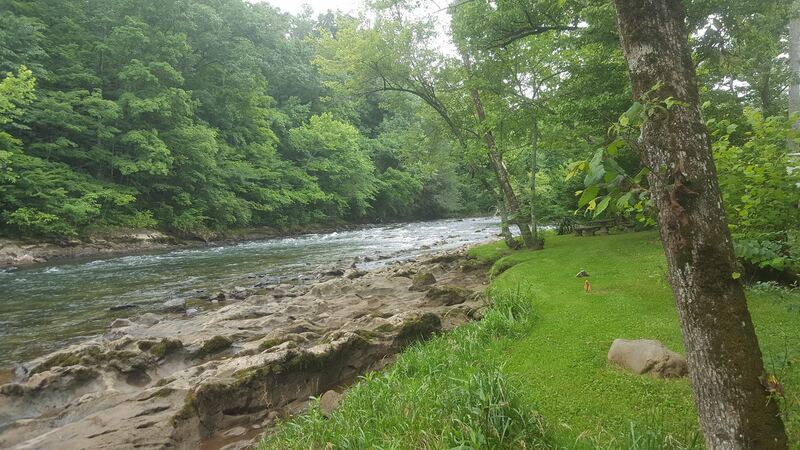 Project Healing Waters Fly Fishing (PHWFF) is dedicated to the physical and emotional rehabilitation of disabled active military service personnel and disabled veterans. PHWFF is unique in that volunteers are teaching fly fishing classes on an on-going, long-term basis. It is much more than a one-day fishing trip. Program activities include fly fishing instruction, fly tying classes, fly casting workshops, rod building and fly fishing outings. Last year, PHWFF served more than 7,000 veteran participants at their 200-plus programs nationwide. 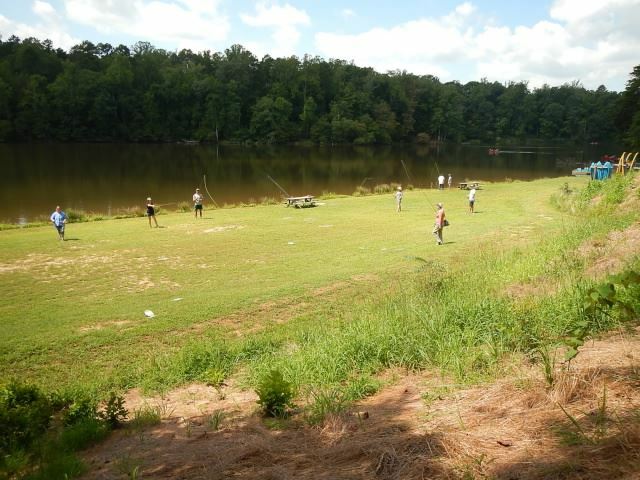 The Carolina fly casting team (Gary Jones, Jack Cunningham, Lee Butler, Jim Mackey and Dave MacBurnie) was at Lake Norman State Park on Saturday, August 25th. 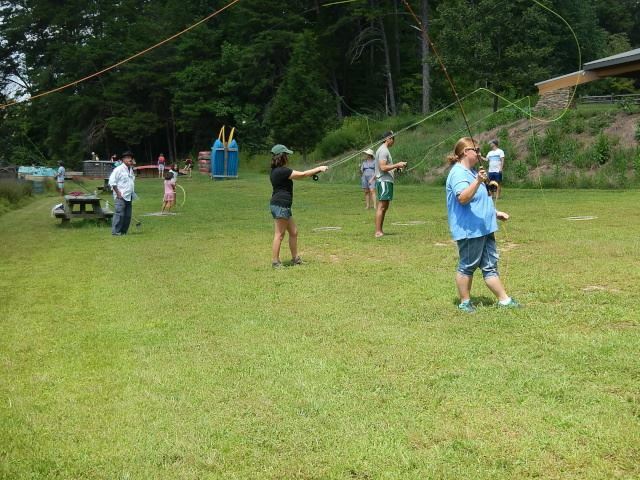 They provided fly casting instruction to eleven students. The students ranged in age from six years old to fifty plus years. The skill levels ranged from beginners to intermediate. Significant improvement was observed in all students. One student that never cast a fly rod caught several fish. They all were very appreciative for the casting instruction. The club thanks Gary, Jack, Lee, Jim and Dave. What a weekend.......rain, pouring rain and more rain! Met some great folks who know how to make the best of it. Drinking, eating, laughing and storytelling were the main events! Even had a couple of guitar players, playing jazz songs at its best. No fishing, wading or drifting because the river was about 3-5 feet above its normal flow and very murky. Several folks did take their crafts on Saturday, our only day of sunshine, for a ride on what normally would have been an 8 hour float and made it in 4 hours. Fast water for sure. 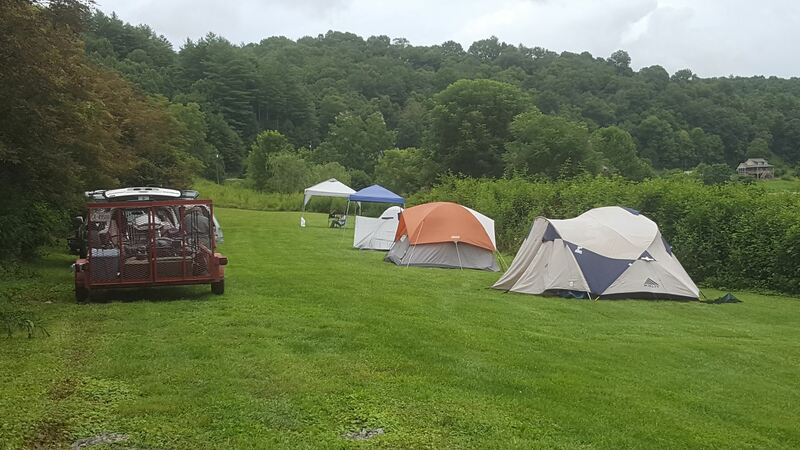 Zaloo's Outpost is a good campground with easy access and plenty of room to spread out. Will say the showers could have been better though. Can't control the water flow, just a pull cord and no hot water. Cold showers make for a very quick one. Must be to save the water, HA! All in all, a disappointing weekend, but made some great acquaintances. 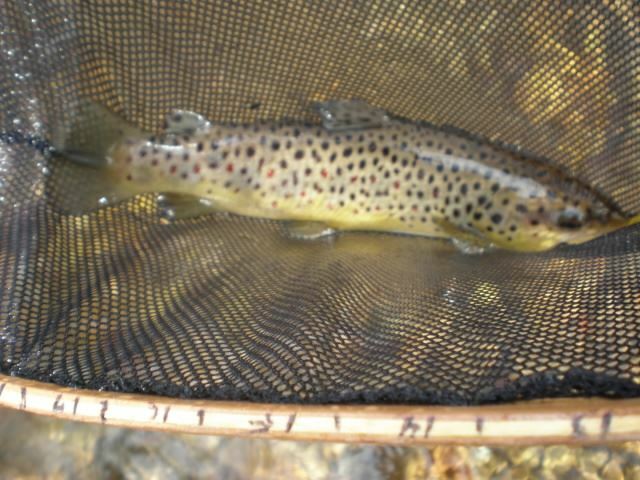 Look forward to their fall outing at Camp Stonefly in October.......See you on the water on the next one. 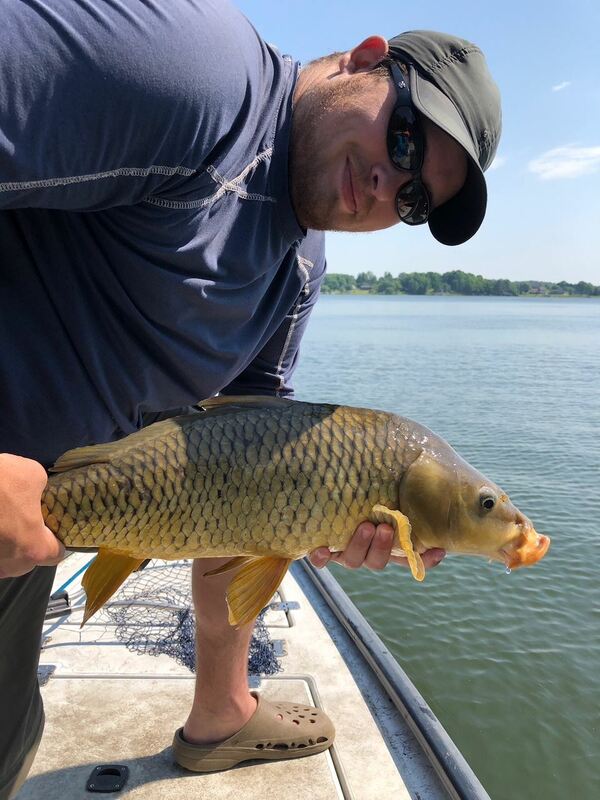 Hello my name is Henry Fowler and would like to take you sight fishing for carp in NC. This is a sight fishing game. We will be patrolling the shallows searching for feeding fish. When we locate a fish we will make careful casts in front of it to elicit a strike. I must warn these fish are difficult at times to get to eat. If you connect to a fish it is on. The average size of these fish is 5 to 10 pounds. Hmmmmm, no one else showed up for the outing today, so around 9:10 I found a spot to fish and started to enjoy the day. Along comes a very nice lady Kathy Lindenberger who is also a member of the club and newer to the sport than me. 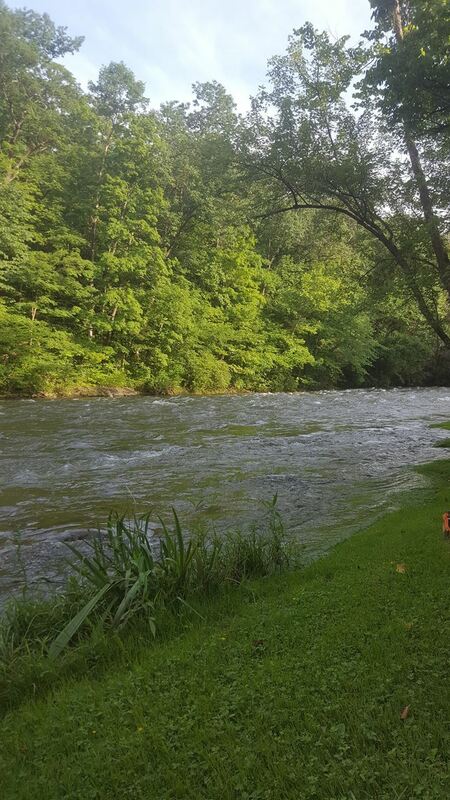 We spent the day fishing together, in beautiful weather in some very nice clear water, but it was fast moving. 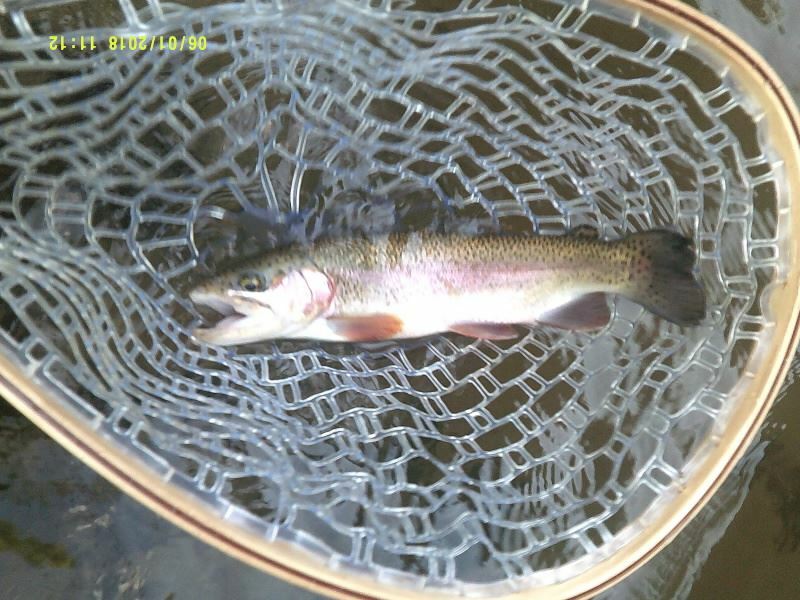 I caught several nice trout, example in picture. The best flies were a green San Juan worm and a rubber leg bug with an orange bead. Got to use my new rod, a Redington Crux 9' 5 wt and it was fabulous. It has a very informative feel, easy to cast and a pleasure to use. Special shout out and thanks to Richard at Carolina Mountain Sports for helping me get the rod/reel set up yesterday. 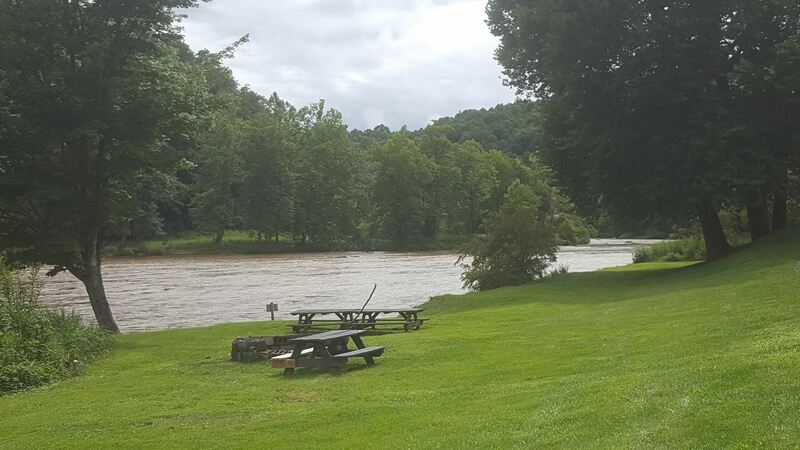 Nantahala/Tuckasegee River - Whistle Stop Lodge. Congratulations to our very own Roger Lowe! We would like to take a moment to congratulate Roger for being inducted into the Southern Appalachian Hall of Fame. Recognition couldn't have gone to a more deserving person. Roger has spent a lifetime in this industry. Prior to coming on board with Brookings, Roger owned and operated his own fly shop, "Lowe's Fly Shop" in Waynesville for 15 years. Prior to that, he tied flied commercially for retailers all around the south. He's authored books, and taught one hell of a lot of people to fly fish and tie flies. Roger has had a tremendous impact on the sport of fly fishing in this region, but must importantly he is just a great guy. We are proud to have him on our team.